This is why I keep telling people that drugs are bad. The Mazda MX-5 is a fantastic automobile that brings endless smiles and a relentlessly reliable driving experience; the Alfa Romeo Giulietta Spider is a hauntingly beautiful car with classic street cred, unmatched in its price range. Unfortunately, if you try to combine them into one vehicle...well...let's just say it isn't as good as it looked on the paper you just rolled up for snorting purposes. The Spider front end goes with the MX-5 body about as well as peanut butter goes with ebola between two pieces of white bread. 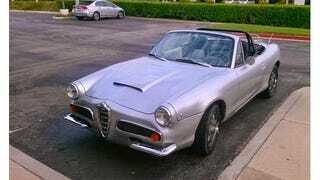 Find this 2000 Mazda MX-5 Custom 60s Alfa look offered for $8,000 in Laguna Beach, CA via craigslist. It might be a bit unfair to compare the product of some fabricators time to a deadly disease...but I think my eyes are starting to bleed a little bit. The front end picks up certain aspects of the Tipo 101 front grill, but the bumper and radiator openings are wide-set in a catfish like grin. The only thing for certain is that someone spent a huge chunk of time forming the sheet metal and/or fiberglass front end because this doesn't look like a kit you could buy. The back end on the other hand is much more aesthetically pleasing. What is up with those wheels? From a mechanical perspective this car appears to be 2nd generation Mazda MX-5, which means it is powered by a 1.8 liter inline-4 cylinder engine that pushes 140 horsepower and 119 ft-lbs of torque into a 5 speed manual gearbox. Out back things are actually not that horrible looking, and it looks like something you might not be ashamed to drive if the Alfa Romeo badge was removed. Originally published as 5k: Mialfa Romazda: 2000 Mazda MX-5 Custom 60s Alfa on Daily Turismo.